Hai Tac archipelago is dubbed as the “Ha Long of the southern region”, thanks to its pristine natural beauty and fresh and cool atmosphere. NDO – The National Assembly Standing Committee recently passed a resolution on the establishment of Ha Tien city in the southern province of Kien Giang. The resolution is expected to bring into full play Ha Tien’s tourism potential. Ha Tien town was established in July 1998. The new Ha Tien city will have a total area of 100.49km². It borders Giang Thanh district to the east, the Gulf of Thailand to the west, Kien Luong district to the south and Cambodia to the north. It is located in the coastal economic belt of Vietnam-Cambodia-Thailand, occupying an important position in the key national tourism development area of Rach Gia - Ha Tien - Phu Quoc. It has huge potential for development in tourism and border trade. Ha Tien is a unique locality in the Mekong delta, host to assorted types of terrain, ranging from plains and forests to seas and islands. Not only possessing a number of beautiful tourist attractions such as Tam Bao pagoda, Phao Dai and Binh San mountains, Thach Dong and Da Dung tourist sites, and Dong Ho lagoon, Ha Tien also attracts visitors to explore the historical and cultural vestiges which mark significant historical milestones in the ancestors’ journey to expand the territory. Ha Tien welcomes travellers at any time of the year. During the first lunar month, tourists can take part in an annual celebration to mark the anniversary of the Chieu Anh Cac Literary Coterie, which was considered as one of the country’s major literary forums in the first half of the 18th century. During the Thanh Minh (tomb sweeping) celebration in the third lunar month, visitors can learn more about the practice of visiting ancestors’ graves and the virtuous tradition of paying gratitude to ancestors. The end of the fifth and early sixth lunar months is the time for locals to worship Mac Cuu, the founder of the land of Ha Tien, and his family members. In the ninth lunar month, Ha Tien is bustling with the Sene Dolta Festival, a major event of the Khmer community to remember their ancestors, with both traditional rituals and social activities. The following month is dedicated to celebrating the Kathina (robe offering), one of the official tradition rituals of Theravada Buddhism, during which Buddhist followers donate new robes to the monks with the hope that both devotees and recipients will gain merits. One of the most visited tourist sites in Ha Tien is Dong Ho lagoon, a wetland covering more than 1,300 ha in the west of the city. Boasting an enchanting range of flora and fauna, the area is a perfect place for nature lovers to explore the ecological diversity. If one is tired of wandering in the forests, exploring caves and lagoons, or visiting pagodas, one can enjoy the fresh air and take a tour to Hai Tac (Pirates) archipelago, a famed place in the southwest sea of the country. The archipelago consists of 24 large and small islands, located 20km from Ha Tien Town and 40km from Phu Quoc Island. Together with Ba Lua archipelago, Hai Tac is dubbed as the “Ha Long of the southern region”, thanks to its pristine natural beauty and fresh and cool atmosphere. In December 2017, the Kien Giang provincial People’s Committee recognised the archipelago as a local tourism site. Thanks to its diverse tourism potential and efforts made by the local authorities and people, Ha Tien has witnessed remarkable growth in tourism over recent years, accordingly to Nguyen Thanh Nhan, Secretary of the city Party Committee and Chairman of the city People’s Committee. 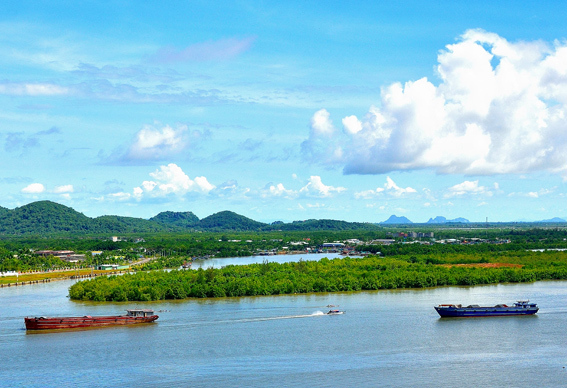 Accordingly, Ha Tien welcomes more than 2 million visitors every year. There are over 160 tourism facilities operating in the city, which can accommodate nearly 2,500 holiday makers. Under its master plan on developing tourism, the city has set a target of receiving 3 million visitors with total tourism revenues of VND2.7 trillion by 2020. The figures are expected to reach 4.4 million and VND9.4 trillion by 2025 and 6.4 million and VND34.5 trillion by 2030, respectively. The recent National Assembly Standing Committee’s resolution on the establishment of Ha Tien city will undoubtedly give a boost to the city’s hospitality sector, contributing to realising the set targets.